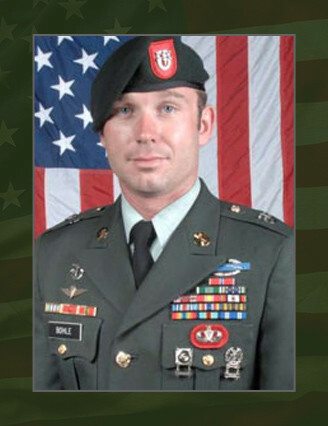 Sgt.1st Class Bradley S. Bohle, 29, died on Sept. 16, after his vehicle was struck by an improvised explosive device, while conducting a mounted patrol in the Afghan city of Ghur Ghuri, in support of combat operations while serving with Company A, 3rd Battalion, 7th Special Forces Group (Airborne). He deployed in support of Operation Enduring Freedom in July 2009 as a member of the Combined Joint Special Operations Task Force – Afghanistan. This was his second deployment to Afghanistan in support of the Global War on Terror. He also deployed twice to the Philippines. He was a Special Forces medical sergeant. Bohle, a native of Baltimore, Md., enlisted into the U.S. Army 1998 as an Information Systems Operator. He was assigned to 2nd Bn., 8th Infantry Regiment, 4th Infantry Division (Mechanized). He later served with 112th Signal Battalion (Airborne) and 4th Psychological Operations Group (Airborne) before deciding to pursue the goal of becoming a Special Forces Soldier in 2006 by attending the Special Forces Selection and Assessment. He completed the Special Forces Qualification Course March 2008 and earned the coveted “Green Beret” as a Special Forces medical sergeant. He was assigned to Co. A, 3rd Bn., 7th SFG (A). Bohle’s military education includes the Warrior Leader’s Course, Basic NCO Course, Survival, Evasion, Resistance and Escape Course, Basic Airborne Course, Jumpmaster Course, and Special Forces Qualification Course. His awards and decorations include the Bronze Star Medal, Purple Heart Medal, Army Commendation Medal, Army Achievement Medal, Meritorious Unit Citation, Army Good Conduct Medal, National Defense Service Medal, Afghanistan Campaign Medal, Global War on Terrorism Expeditionary Medal, Global War on Terrorism Service Medal, NCO Professional Development Ribbon, Army Service Ribbon, Overseas Service Ribbon, NATO Medal, Combat Infantryman Badge, Senior Parachutist Badge, Driver and Mechanics Badge and the Special Forces Tab. Bohle is survived by his wife Elizabeth and three daughters Jocelyn and Braelyn of Sanford, N.C., Breanna, of Clinton, Conn. and parents Donald and Linda Bohle, of Marydal, Md.